ADC Cirrus engines were originally built by ADC Aircraft until Cirrus Aero Engines Limited was formed in 1927. The company became Cirrus-Hermes in 1931 when it was bought by the Cirrus-Hermes Engineering Company and later became the Cirrus Engine Section of Blackburn & General Aircraft Limited in 1934, and operated as a separate division until production ended in the post-World War II era. Cirrus's first product was the 90 hp (67 kW) Cirrus I, which passed its 50 hour type rating in 1925. 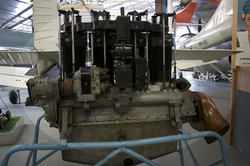 It was the first air-cooled inline engine, a design by Frank Halford that proved extremely popular for light aircraft. The basic layout (using one cylinder bank of an ADC Airdisco V-8 engine) was quickly copied by a number of other manufacturers. Later versions named the Cirrus II, and Cirrus III were produced each with slightly greater displacement, and power (Cirrus II - 85 hp, Cirrus III - 90 hp). The next model line, Cirrus-Hermes I, II, and IV were produced ranging in power from 105 hp to 140 hp depending on type. The later Cirrus engines were designed to run inverted.